She's a glamorous go-getter with nothing temp about her! Full-time, overtime—her makeup, like her day, goes on and on. What she loves: the no-fade staying power of these M∙A∙C Pro Longwear formulas—including new M∙A∙C Pro Longwear Blush. I don’t mean to pick on MAC—really, I don’t. In fact, if the brand didn’t intrigue me so much I’d ignore it (when have I ever written about, say, Maybelline?). It used Miss Piggy for a model, for chrissakes, and even though I hopped right onto that with looking at the version of “authenticity” MAC peddles, the fact remains that I have to admire how well MAC’s marketing team zeroes in on what skeptics comme moi might sniff out in a brand. So at first, when I saw this astute Makeup Museum post critiquing MAC’s latest line, titled Office Hours, I glanced at the styling of the ads for the collection and actually had a knee-jerk defense of the brand. Yes, the ads depict a working woman whose office looks like cotton candy, and who appears to do nothing more demanding than file her nails; yes, they’re styled in a retro fashion, hearkening back to the days when the best a woman could hope for was being head of the secretary pool. I saw the spot-on points the Makeup Museum’s Curator was making—but truth be told, I sorta liked the look of the ads. Pretty much the only fashion trend I’ve endorsed since grunge fell out of favor is the Mad Men-inspired 1960s revival (I’m writing this while sporting a checkered pinafore and a bouffant). The show and the styles it brought back have been critiqued as a manifestation of our national longing to return to a “simpler time”—simpler being code for racist, sexist, and psychically stifled—and perhaps in some aspects it is. But as creatures of 2012, we also have the luxury of being able to see the era in perfect hindsight; in loud shift dresses and winged eyeliner we may see not conformity but a generation of women on the precipice of feminism, rebellion bubbling inside them, just waiting for the right moment to burst forth. Point is: At first I saw the MAC collection as being a reference to where women actually are today, not an idealization of the past. I didn’t even mind the Barbie-fied version of work the ads fed us; I don’t particularly want a “real” work-based makeup collection featuring a shade called Printer Preset Blues, you know? Certainly I wouldn’t want it from MAC, which even more so than other beauty brands is not in the business of reflecting our realities; they’re in the business of creating our fantasies. So, sure, let the vision created with this collection be not an office populated with Flavia coffee machines but a Mad Men-style glam kitsch office where martini hour starts at 3 and Esquivel is piped through the intercom. The campaign is a sort of reverse nod to a trend sociologists have noted in the past several years—a conflation of work and leisure (or “weisure,” if you must) most readily visible in the expectation that because new technologies allow us to be available 24/7, we’ll actually be available 24/7. Theoretically, the upside is a more flexible work culture (I can work poolside on my smartphone! ); the downside is an expansion of what can fairly be considered “office hours” (must I work poolside on my smartphone?). Running parallel to the phenomenon of working hours coming to resemble leisure is the phenomenon of leisure time beginning to resemble work. I mean, when else in the history of humankind have 34 million people signed up to spend their leisure time tending imaginary farms? Or eagerly signed up for the privilege of basically creating our own timesheets of time-and-place accountability? The idea behind things like Farmville and Foursquare is that our leisure time will seem somehow more pleasurable if we view it through the lens of work; they provide us with rules, feedback on our own activities, and clearly defined parameters. There is comfort in regulation. 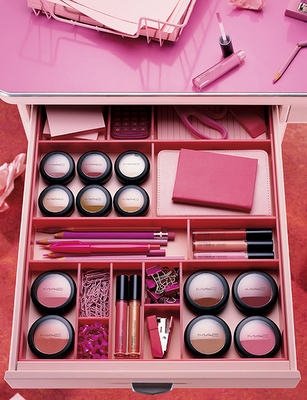 And so it is with MAC’s Office Collection: Beyond the kooky pink kitsch of the ads, there’s definite—and appealing—order. Lip glosses take their place in the office drawer alongside paper clips and staple removers; blush compacts line up next to perfectly sharpened pencils. MAC’s immensely popular Lipglass is shown open but immaculate next to a broken pencil (the writing kind, not the eyelining kind), the idea being that Lipglass is more reliable than good old-fashioned work tools. The collection itself reflects the message of regulation behind the campaign (which, I suppose, is the entire point): The shades are neutral, tasteful, traditional. No matter how over-the-top the styling of the campaign may be, right below the “fun” retro styling beats an orderly, conservative heart. These shades are office-ready. The model’s pompadour, the monochrome palette, the exaggerated 1960s look: MAC gives us a glamorized version of office work here, which we need in order to want to participate. The company is partially relying upon its reputation as an innovator in the field in order to give us a wink and a nod—you know we’re not really saying you should want to be an office drone, right? Yet without the products themselves having any subversive qualities (pink blush! taupe eyeshadow! oh my!) it becomes clear what the campaign is: the packaging of a rather boring color collection that still lets us get our kooky side on. That is, it’s doing exactly what marketing is supposed to do—highlighting hopes and fantasies we may have hushed over time, but ultimately just feeding us versions of ourselves. Such a different, nuanced and incredibly well-written take on the collection, especially when you compare it to my admittedly angry and inelegant rant! (Can you tell how much I envy freelancers and hate office work?!) Excellent analysis and so interesting to see a different view on it. And as always, thank you for the mention!! Most chanel replica handbags not to mention observations said following might possibly over the long haul aid you in preparing see the genuine piece of writing. It happens to be well-known that her Chanel pouch is really steeply-priced, which means a professional selling distribute these matters by reduced deals should certainly instantaneously heighten some inflammed cartier replica uk. Promotions are given towards earlier not to mention phased out services, and yet perhaps even that is not made available especially easily, for the reason that chanel replica continues a good quality device. Virtually all louis vuitton replica sale have a relatively serial phone number specific in the device of which monitors all four from making. There needs to be certainly no anomalies from all kinds in your seams, stitches, sheet metal buckles, eating places, zippers, not to mention belts, and then the leatherette could be of this perfect good through look not to mention formation. Its of course the case the valued prada replica force you to delightful as they are routinely noticed in typically the wrists and hands from performers. Even if hassle-free, you will find a particular sublte style to fix it. Coco Chanel found some deep expertise in revamped attractiveness when ever this lady to begin with established these products.